Argentinian artist Jorge Macchi’s practice encompasses a variety of media, including video, installation, sculpture, sound, and watercolor. 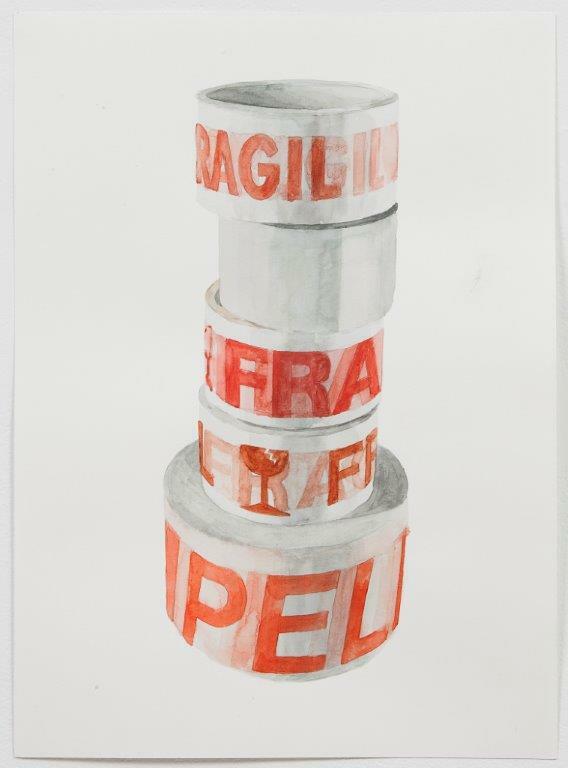 A poetic, uncanny quality permeates much of Macchi’s work, as seen here in his delicate rendering of tape rolls bearing the words FRAGIL and PELIGRO (“fragile” and “danger” in Spanish). Macchi’s use of watercolor deftly conveys the transparent tape and repeated layers of words, and the off-kilter stack takes on an architectural presence. Jorge Macchi lives and works in Buenos Aires. Earlier this year, ten large-scale installation works from 2007–2013 were shown in Container – a one-person exhibition at the Kunstmuseum, Lucerne. In 2011, his work was the subject of a survey exhibition, Music Stands Still at the Museum of Contemporary Art (SMAK) in Ghent. His work was represented in the 11th Biennale de Lyon; the 12th Istanbul Biennial; All of this and nothing, Hammer Museum, Los Angeles; and Brave New Worlds at the Walker Art Center, Minneapolis. In 2005, Jorge Macchi, in collaboration with Edgardo Rudnitzky, represented Argentina at the Venice Biennale.